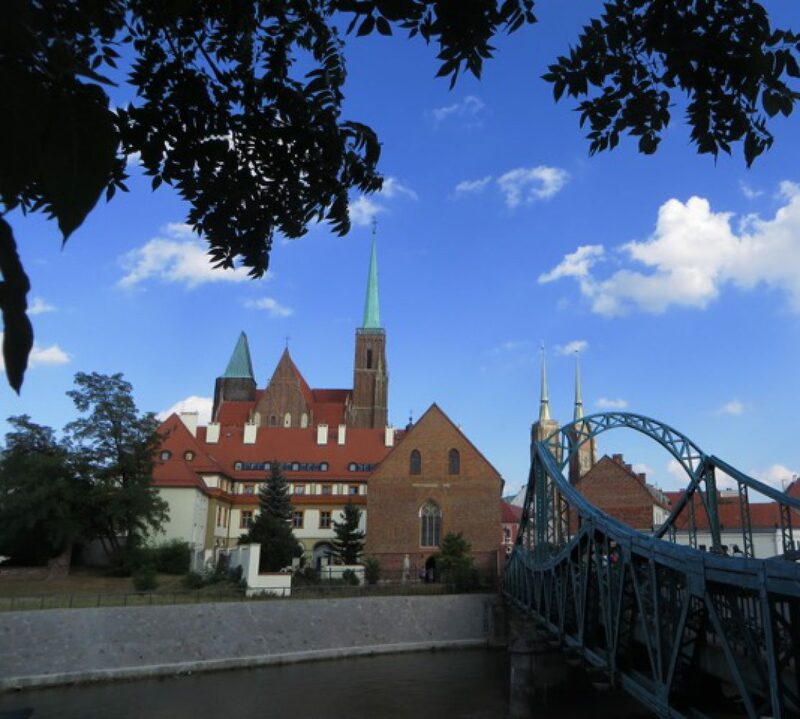 There are lots of obvious charms here in Wroclaw, including the architecture and food. 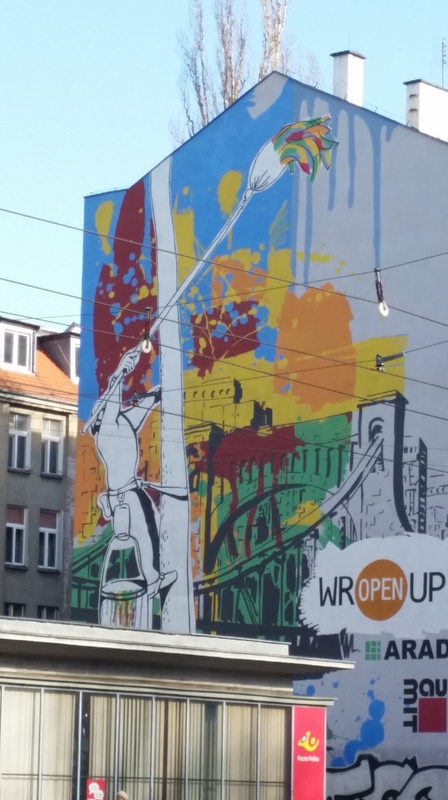 But one of the more fun thrills is the unexpected one of Wroclaw’s abundant murals. Blank walls here have been painted, many with whimsy, some with sardonic wit, others with more blatant messages (yes, there are also advertisements.) 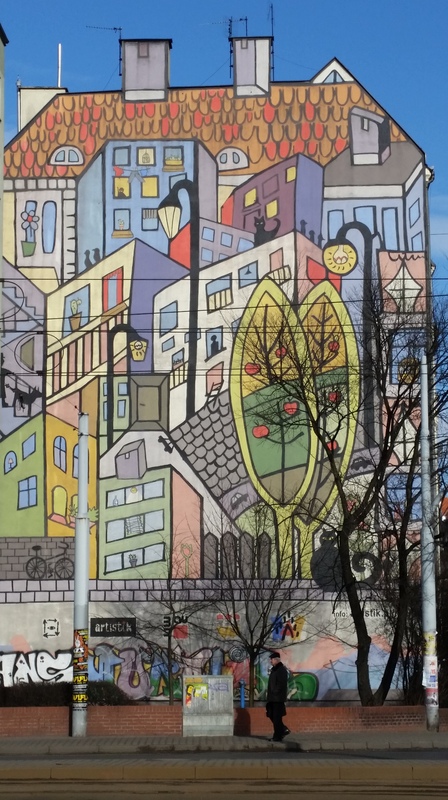 Here’s a quick rundown of our favorite murals in this fun, dynamic city. Accordian Pig: Just down the block from our house, this musical pig kicks back in red boots, serenading someone we can’t see. Or perhaps just making a joyful noise? Moneybag Pillow Sleeper. This guy is doubly clever – his eyes are actual windows, making him look sometimes like he sleeps with one eye open. The better to guard his money, I suppose. This lovely lady is on the side of a building on Sand Island, overlooking a park. She’s wearing a dress made of locks, and swallowing a key. The symbolism is obvious, yes? Right next to the Lock Lady is Sad Handcuffed Gorilla. 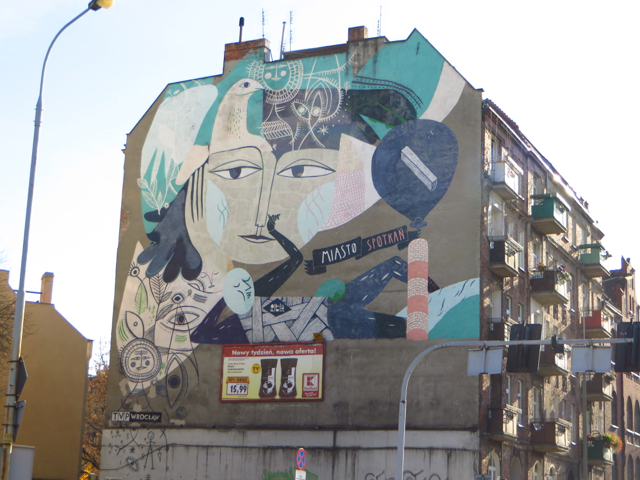 This mural hangs over a large plaza near a major tram stop in our neighborhood, known as Nadodrze (pronounced nad-ord-jah. Or something.) It shows off the classic architecture and energy of this up-and-coming neighborhood. This piece, also in our neighborhood, seems to be telling us something but I’m not sure what it is. 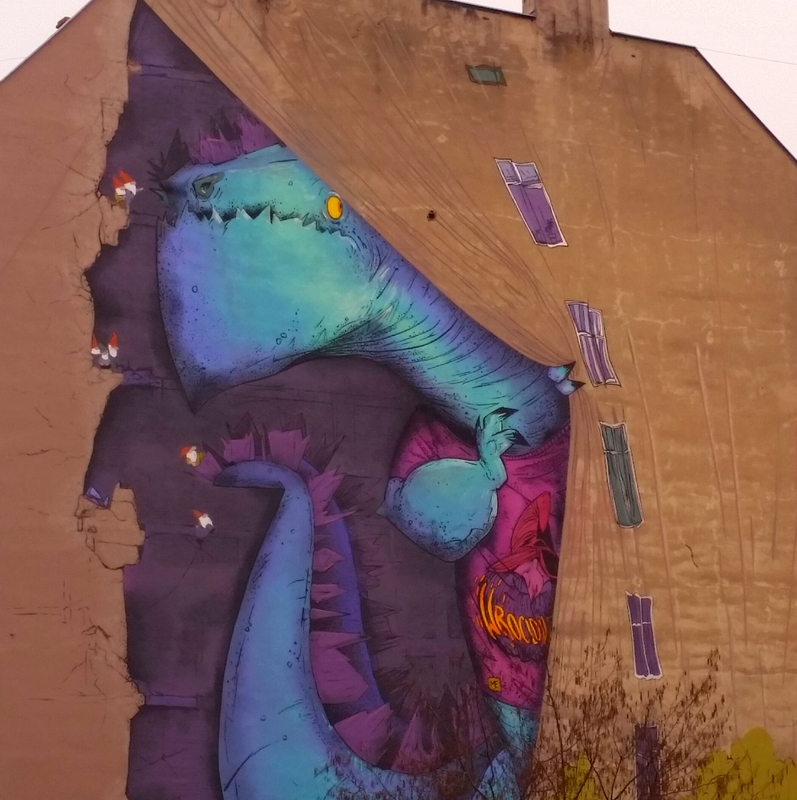 Here’s a cute little tromp l’oel: pulling aside the skin of the building and peeping out to see what the weather is like is a cute blue dinosaur! Several gnomes stand on the wreckage offering encouragement for him to go out and have a good time. Tucked into a narrow building is this festive collection of street scenes rendered in bright colors and simple shapes. Against the bright blue sky it’s a very cheerful sight for weary passersby. Another splash of bright color, this one goes meta, showing a painting of a painter splashing color on the side of an otherwise colorless city scene. A man relaxes, and above him images churn: a woman, a bird, an angel. City of Meetings, says the banner. This is one of Wroclaw’s slogans, which describes the city’s origins as a crossing of two trade routes, and its future as a place where international corporations have headquarters and manufacturing plants.